Professional Table Traditional with marble for Restaurant, Tavern, Bistro, Pub, Gastro, Ouzeri, Cafeteria, Cafe Bar Table from 76 € (size 80×80). The Professional Traditional Wooden table is available in all dimensions, available in paints Impregnation Glaze Aging & Varnishes in various colors. 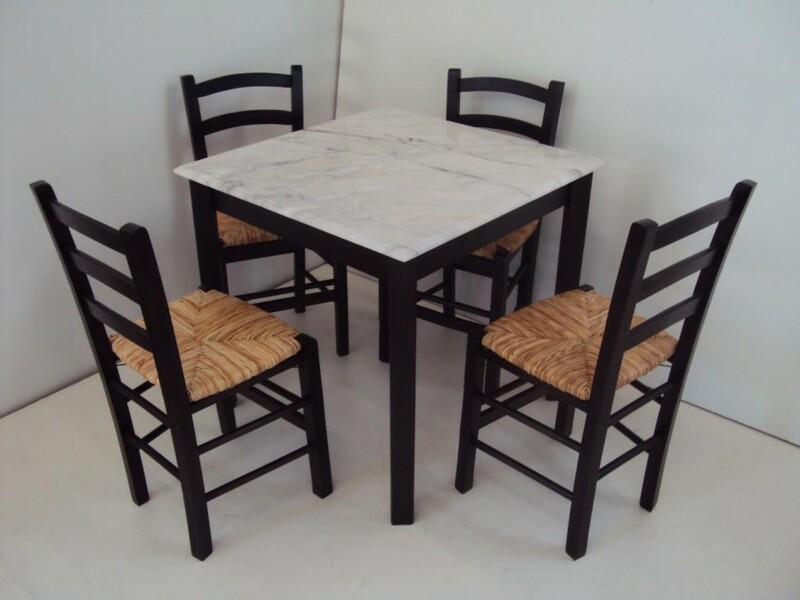 The Professional Traditional Wooden Table is manufactured by us of extreme resistance suitable for Equipment Branch Food as Restaurants, Cafes, Cafeterias, Taverns, Cafe Bar, Ouzo, Gastro & more. The Professional Traditional Wooden table is available in all dimensions, available in paints Impregnation Glaze Aging & Lacquers in various colors, paints are made with electrostatic painting using Italian Varnishes. Natural wicker seat, from 4,4 € Physical Rattan seat for Chair Cafe restaurant tavern cafe (35×39 cm).Cloths for Director chairs (Perforated PVC).